Philly 2nd baseman Chase Utley has hit safely in 32 straight games. A few more and he will be in a class with few others. Let me know when he gets to 40 and I will pay more attention. It was fun for me as a kid to see the great Pete Rose go after Dimaggio's untouchable 56 games. I think Rose made it to 44. Along the way Rose had a few bunt hits and driblers but give him credit. Utley is a great hitter and one of the up and coming starts of the game. He is of the few guys Philly should keep and rebuild around. enjoying a solid year as well as being a new fan favorite in NY. They did it again. The Yankees made a move today with 24hrs left to ge until the trade deadline. They got Bobby Abreu and pitcher C. Lidle from Philly for a few prospects. The prospects did include a 05 first round pick but the Yankees made out like bandits. Abreu may not hit as many homers as Giambi , but he will get on base and probably do well as a Yankee. Lidle is at least an improvement at the #5 starter. Hes better than Ponson who didnt do well in his NY tryouts. This move also likely spells the end for Sheffield in pinstripes. His contract is up this year and Abreu will fit nicely into right field for the next two years. Sweet Deal For The Brew Crew ! Today Brewers GM Doug Melvin announced his newest addition to the Brewers team. He signed 'Chorizo' , aka 'El Picante' , aka 'Cinco' , to an undisclosed deal with the team. Chorizo will run in this saturdays sausage race and then go down to the minors to fine tune his game. 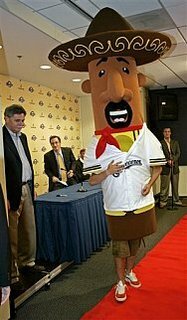 Chorizo will be back up in the bigs on opening day 07 and be a regular part of the races. Due to the White Sox going into a huge slump , the AL wild card has opened up and is anyones for the taking. The Yankees now have the wildcard fallback ripe for the taking. The Twins are on the move with some really good solid pitching. The big suprise here is the downward spiral of the White Sox. This is the same slump they went into last season in september. Only to pour it on in the playoffs. With the trading deadline under a week away , one big trade could shift the balance of power in the AL. This is how we like it . Lots of teams still in the race right up until the end. And of course its the fans who win. The Braves yesterday traded for Bob Wickman. The former closer of the Indians will now move down south for his next stop. Wickman is a veteran who has closed for many teams over the years. He was actually the closer for the Yankees - pre Riveria/Wetland .. This may signal Clevland throwing in the towel. With 3 other teams to try and climb over in the central , the Indians may be looking at reality. The Braves on the other hand are trying to make a run and deperatly need bullpen help. Wickman may not be the Braves answer for the future , but for a couple of prospects hes a good grab for Atlanta. The Blue Jay's cut DH Shea Hillenbrand yesterday. This comes after he was chastised at a team meating and then refused to sit in the dugout with the team. Earlier in the day Hillenbrand criticized the organization and asked to be traded. I guess he was pissed because he had to sit out two days in a row. He also was pissed due to the 'rumor' the front office didnt congratulate him on his adoption of a baby girl. While he was having a decent first half and its great he adopted a child , its still time to grow up a little Shea. You dont need a pat on the fanny every time you do something good. This is the time of year players get an extra day off too. The dog days of summer can bring the best of them down. In the long run this is probably a good move for the up and coming Toronto. They need team players to help bring the team forward in the next year or so..
Dont look now Mets fans but the Atlanta Braves are making another run at the NL east. Seems like the Braves are not quite ready to give up the division yet. Allthough there pitching has not been great , the offense has been over the top. Last nights game was a 15 run blowout of the Card's . Without a closer , or decent bullpenn for that matter , I doubt the Braves can make it and win the division. Keep scoring 15 runs a game and they wont need a bullpenn.. Twins centerfielder Tori Hunter was put on the DL today with a broken foot. This is the second year in a row he has missed time for injuries. This also comes at a bad time for the Twins who are trying to make a run going into the second half. With some good pitching the Twins actually have a chance but its not easy with the Sox and Tigers ahead of them. The second half starts tonight. This is also the unofficial start of the trade season. Allready a few small moves have been made. The Yankees picked up Sidnee Ponson to try to help there # 5 and the Astros picked up slugger Aubrey Huff . Huff should help the Stro's lineup while Ponson may be gone after a few bad starts. Sometimes its the trade the doesnt happen that helps a team the most. Nothing worse than a bad trade to set the team back a few years. Should be a good second half with many teams still with a chance at playoff games..
All star time is upon us again. I dont make to big a fuss about the all star game. Most all star games in any league are more of a show than a game.I dont agree with it , but Im ok with the game meaning home field in the world series. I still feel best record should be worth something. For me, the best thing about the game is the start. Its cool to see the stars lined up on the field as they are introduced. After that , maybee I can watch an inning or two. This year there are almost no games on thursday so it seems like a long break. The first half has been good and lets hope the dog days are just as fun. A little side note..... Ryan Howard of the Phillies won the HR derby. Little Ball favorite David Wright came in a close 2nd. Not a bad day for many 'new' stars. When you watch a little of the game tonight , notice how the young stars have taken over the game. Its really great to see too !! The White Sox and Red Sox played a 19 inning game today with the White Sox winning on a rbi hit by Tad Iguchi. I saw the last few innings myself and as they were about to start the 19th the announcer said "lets play 3". What a way the end a great first half in baseball. The biggest suprise is the young stars taking control of the game. Its a new era and its allright by me..
Former Mariners closer Eddie Guardado was traded today to the Cinncinatti Reds. Guardado had lost his closer spot this year due to lousy numbers. In Cinnci he will get a shot closing again. This is a good move for the Reds. While it wont send them over the top , it will help them in the bullpen if Guardado can give them anything. Every team needs bullpen help and sometimes its hard to find. The Reds play in a hitters park so cross your fingers and hope for the best with Guardado. Barry Bonds trainer Greg Anderson went back into jail today. Anderson refused to talk about Bonds and was held in contempt of court. He could do over a year for not talking. While we all know Barry did the roids , Anderson (a lifelong friend of Bonds) has not implicated Bonds at all. Give Anderson credit , he is no rat. He will do his time and move on . Hey Barry , your gonna need to buy Anderson a house after this is over. MLB has a policy now. I support it. Lets move on and enjoy the game. Alex Rodriguez (aka: Arod) has been getting booed every time he goes to the plate. No Im not talking about on the road where most stars get a rowdy reception. Im talking about right in the Bronx at Yankee stadium. While its true ARod is in the middle of probably the worst slump of his career , the Yankees are going to win or loose with him. I talked to my brother(lifetime Yankee fan) a little about this . Its kinda like the Yankee fans live and die with the team and want ARod to do better. Still it must be tough to hear boos in your own stadium. It comes down to this , ARod is not Jeter. Jeter is a Yankee personafied and the fans will allways have there #1. These are the same fans who booed Roger Maris in his run to 61. Mostly because he wasnt the great Mickey Mantle. The way I see it is that even if ARod has the worst year of his career , he was still the MVP last year so give the guy a break. Dont worry , if I know the crazy Yankee fans , as soon as he starts putting up big numbers again the fans will go crazy and show him the love.